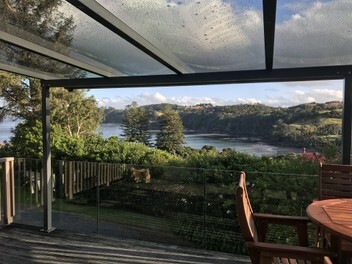 Email me your contact details and some idea of sizes including photos to info@deckf­ix.co.nz We can then advise the best flexiroof that works for you! Email for your free quote!! This is why our modular system features an industry leading 1,000mm rafter spacing - allowing you to see more of the clouds, sky, rain and stars. Our rafters are designed to have 12V LED lights. These are flush fitting with a very nice stainless steel bezel. Our 15 year warranty is the best you will find in our space! Our roof unit pricelist is simple and online for all to see, and each size is available in a choice of 6 configurations to suit various houses. Our fully adjustable stainless brackets are used with 3 of the 6 configurations our Flexiroof shelters are available in.